The Greenygrey proclaims itself Britain’s most famous werewolf. It has been a prolific rise in fame for the greenygrey one, and the GG brand is now known all over the werewolf world. Like a cross between Loki and Scooby Doo on the dog side, and Kerouac and Joanna Lumley on the human, the vegetarian werewolf helps the reader escape the restrictions of the body on an epic virtual travel across North America. 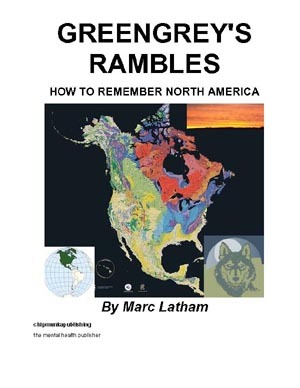 As well as being an entertaining read as GG meets its heroes and lots of new characters across the continent, the book also has an educative angle, as the shape-shifting and chameleonising but mentally a bit muddled superhero creates an acronym map of North America that should help you remember your Newfoundland from your Nunavut and your Idaho from your Iowa. Dr. Marc Latham is 44 and lives in Leeds. Marc grew up in a one-parent family in a small town and was the only child without a (known) father in his primary school class. Despite being a promising student Marc dropped out of school at about twelve years of age, as television and daydreaming took over his life. Ordinary work didn’t interest Marc, and after he didn’t get taken on as a footballer he saved up some money and spent his twenties travelling the world with Kerouac as his inspiration. With his big trips under his belt Marc spent his thirties in university and saw it out to the end of the line, although he jumped off the ‘product creation’ conveyor belt a long time before finishing. 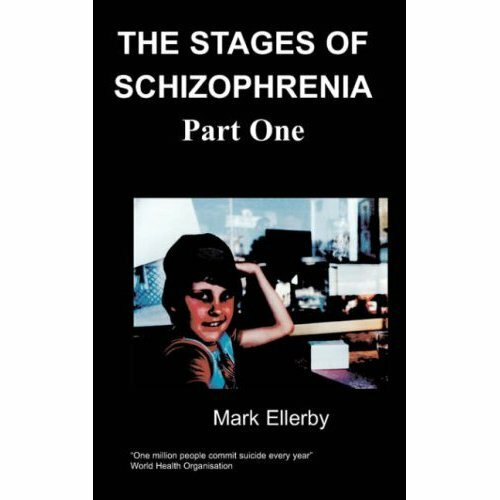 Television documentaries alerted Marc to conditions such as ADHD and bipolarity, and along with his experiences amongst ‘normal’ people these confirmed Marc’s suspicions that he is a bit mad. This realisation, along with running and a healthier life have recently improved the author’s moods, but he hopes to continue being a bit different while becoming a full-time writer. Crossing from the Yukon into Alaska I said goodbye to Canada and hello to the USA. As I free swam down the Yukon River there seemed little difference between the two countries, with wondrous nature in both. The bloody salmon were a bit of a nuisance though, jumping out of the water and hitting me on the bounce all the time! I lunched in Fairbanks, and feeling re-energised crossed the Alaska Range, including scaling Mt. McKinley, which at 20,320 feet (6,194m) is North America’s highest peak. Great views. I arrived at Anchorage before dark, and crossed over to Kodiak Island for a good night's kip. No sign of any bears thankfully!! As I was recapping my journey in D2KNOT (Editor’s note: this was much later in GG’s journey) I realised that I should have gone to Hawaii by now, as it is the most westerly state along with Alaska. So I shape-shifted into an eagle to fly to the west coast, and then as I reached the sea changed into an albatross. My wings were getting tired half way to Hawaii, so I changed into a ray for the last leg of the journey, and glided smoothly up to the beach. After changing back into wolf form I ran up Mauna Kea, Hawaii's tallest peak. It is higher than Everest if you follow it all the way to its base under the sea; I of course started from its salty origins. I rested on the peak for a couple of hours, before making the return journey back to North Dakota. Leaving Kodiak Island soon after sunrise I swam and I swam, passing Yukon and British Columbia, which brought back good memories, until I reached Washington State just after midday. I was cold and tired, but wasn't too hungry, as there'd been a steady supply of seaweed on the way. After a bit of a kip under a refreshing drizzle I made my way to Seattle and Aberdeen, before climbing up the Cascade mountains; I travelled south over them during the day, passing Mount Baker, Glacier Peak, Mount Rainier, Mount St. Helens and finally Mount Adams. I'd eaten an evening meal on Mount Rainier, overlooking Lake Reflection and Tacoma, which was nice. By the time I got to Mount Adams I was just about done in, and was happy to get myself some shuteye. It had been a tough day, but I'd made good progress. I continued along the Cascades into Oregon, and popped down to the 'Rose City' of Portland for breakfast; I recommend the eggs sunny side up, and just love getting those coffee refills. Yep, it was hard to drag myself away, but I made it in the end, and full of carbs and caffeine I almost bounced back up the Cascades. I enjoyed the late morning, running through dense forests that seemed to stretch all the way to the sky. After ascending Mt. Hood I slid down the glaciers to the shores of Trillium Lake, which I then cooled off in under a glorious sky. I'd heard Oregon had a lot of diversity, and I wanted to see it, so I made my way down to the scrublands, prairies, and deserts in the afternoon, before visiting Crater Lake National Park in the evening. Ending the long day in the pristine lake was serene, and I congratulated myself on a well planned day and journey through Oregon. Crossing the border into Nevada I was sorry to leave California, but happy to be entering the silver state. Although I was in a different state I was still in the Mojave Desert, and made good time in the morning along the flat and open land. I headed to the Spring Mountains, and climbed up Mount Charleston to see the sky islands that matched their name in beauty. I could see the wonderful buildings of Las Vegas below, but didn't have time to drop in. Entering the north of the state I travelled through the Great Basin Desert, and after crossing the Humboldt River I climbed up Wheeler Peak to watch the sunset. Nevada had not disappointed.